So far, most of my loop braiding tutorials teach braids, or methods, that aren’t taught anywhere else. These include very basic beginning level tutorials, and range up to some that might seem ridiculously difficult before you’ve “worked up” to them. (Check out my tutorials page.) But there are lots of other great loop braids that you can find instructions for online. Above is a really fun 15th C. English braid called Grene dorge — a.k.a. grene dorg/ grene d’org — which means Barleycorn. The braiding moves incorporate the moves of a square braid and the moves for a Spiral braid. (A very similar braid is also braided by the Wayuu people of Columbia! see the last footnote in my Medieval Braid from a German Cathedral post.) This one in my photo is made out of navy-colored wool (the square braid part), and orange and white silk yarn (the “spiral” move part). This braid can also be made double-width by two people co-operating on one braid, or by one braider managing a lot of extra loops (the ‘Grene Dorge of 12 bows’—seventh braid from the left in my header picture). Fingerloop.org is a real treasure, a very generous offering by Lois Swales and Zoe Kuhn-Williams, the site-authors. My first year or so of braiding I spent making 9-loop square and flat braids, and learning various other types of braids from fingerloop.org. 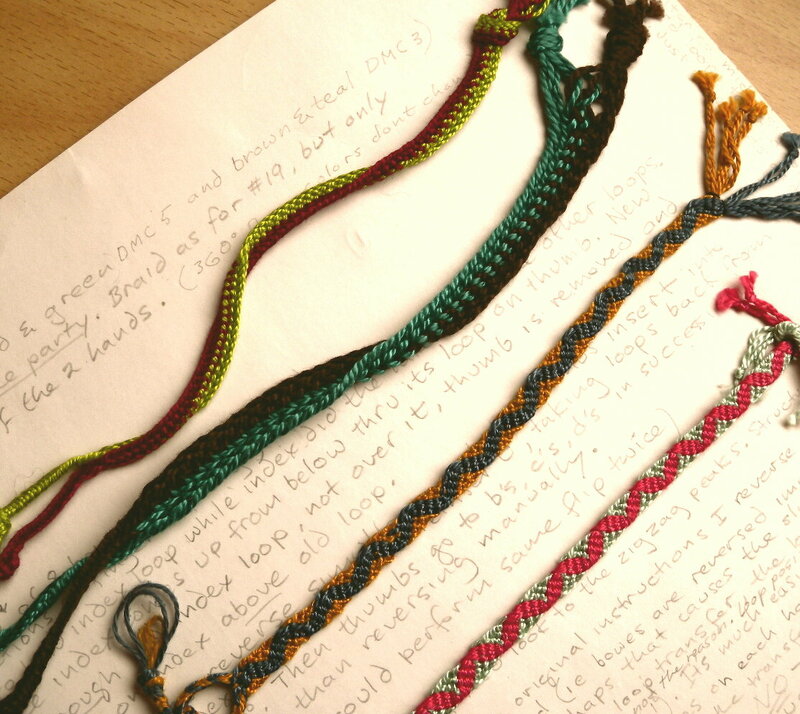 The first photo in this post shows a page from my binder of braid samples from back then. On fingerloop.org’s Braid Patterns page, the braids are organized by difficulty, easiest first. Each braid instruction is first shown in the original archaic wording, and then in a word-for-word translation—which still comes out a bit different from modern English. Thirdly—and best for learning the braid—comes a modern version of the directions by the authors along with a chart of the moves. Usually there is a photo of a sample braid as well. A, B, C, D mean index, middle, ring and little fingers (or the loop on that finger). And L means left hand and R means right hand. Right or left always comes second and is underlined. and “Unreversed” means the loop does not get a turn. The little video on fingerloop.org’s “basic braiding instructions” link shows loops being taken ‘reversed’ (the loop gets a half-turn as it passes over to the other hand). But why does the way they say to braid look so different??? As to why “their” way of braiding the most basic braids looks different than “my” way: Fingerloop.org (and just about everyone else in print or online) teaches the basic braids the way they were done in Europe, which is in a backward direction from how I teach them. Or else it’s me, along with all the loop braiders in Asia and the Pacific, that are backward! It might seem hard to believe, but both methods make the same basic braids. There are also some great braids that are made by completely different methods than either of these two opposite/ complementary ones, like the Spiral braids (video links for these are at the bottom of my tutorials page). Fingerloop.org also teaches this braid. The 15th C term for the Spiral braid is “lace bend round.” There are other braids made with this type of braiding, as well, where loops are exchanged between pairs of fingers, back and forth across the two hands. Just keep calm and remember your A, B, C, D + L and R and you’ll do fine! It really is pretty amazing how many beautiful little braids people had figured out in the 15th and 17th Centuries. The braids I mention above are just some of the ones that could be made by a solo braider. I’m not even getting into any of the amazing multiple-braider braids—the 17th C manuscripts had over 20 of these. (Fingerloop.org teaches some of these, too). Tak V Bowes, Departed by Elizabeth Benns and Gina Barrett. It’s less pricey than OEPBforLB, $36 currently. [update March 2015 – Unfortunately it too is now out of print–search for it used…] Its glossy, full-color illustrations give a lot of incentive for learning the braids! By the way, “Tak V bowes, departed” translates as “Take 5 loops, bicolor.” These are words that begin more than one 15th C. braid instruction! Fingerloop.org’s info is available in print as a very handy and extremely inexpensive booklet (see their homepage). 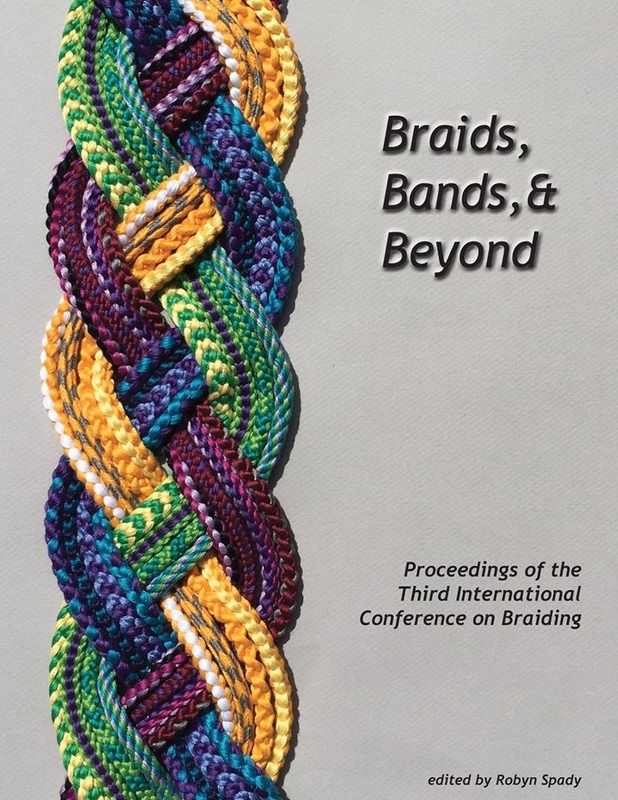 It’s not as complete as the website—the whole lower section of braids in the “Braid Patterns” were added to the website later, and include some very pretty single-worker braids. (Unless maybe the booklet has been updated since I got mine.) Check the errata for the booklet on fingerloop.org’s home page and make the corrections into the booklet. can you loop braid with 3 colors? Sure, the second photo in this post shows a loop braid with three colors. Do you mean the braids in the first photo? That “wavy” motif braid looks very nice as a 3-color braid. My examples just used one color for the “wave” motif, and one for the background. But this braid also looks great when the wave is made from two colors against one background color. The wave can either be two colors side-by-side, or one central color outlined by one or two other colors…In fact the wave motif could even be made up of 4 narrow stripes of different colors side-by-side against one background color, for a 5-color braid. In general with loop braids, you can use up to twice as many colors as you have loops. Each loop is made of two strands, so each strand can potentially be a different color. It would make a rather busy “rainbow” braid, which can be a great look.